The White House is standing behind U.S. Interior Secretary Ryan Zinke who has claimed no involvement in a $300 million contract awarded to Whitefish Energy, a small firm based in his Montana hometown. During a briefing Friday, a reporter asked press secretary Sarah Huckabee Sanders if President Trump had asked Zinke about the deal in their meeting earlier in the day. 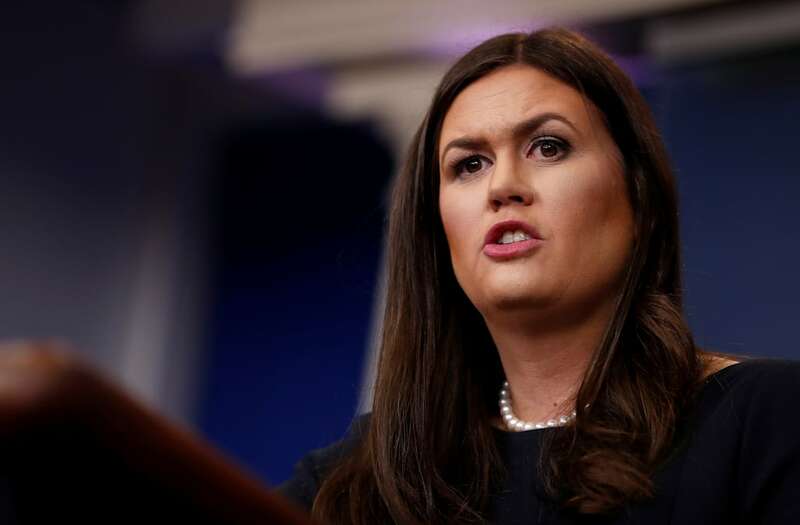 “[The president] did ask Secretary Zinke just for clarification purposes and he reiterated, once again, that we have no role — the federal government, and specifically he, had no role in that contract,” Sanders said. Sergeant First Class Eladio Tirado, who is from Puerto Rico, inspects the rear rotor of a UH-60 Blackhawk helicopter from the First Armored Division's Combat Aviation Brigade during recovery efforts following Hurricane Maria, in Roosevelt Roads Naval Station, Puerto Rico, October 7, 2017. REUTERS/Lucas Jackson SEARCH "JACKSON TIRADO" FOR THIS STORY. SEARCH "WIDER IMAGE" FOR ALL STORIES. Crew member Bynum stands in tropical rain as a HH-60 Blackhawk helicopter from 101st Airborne Division's "Dustoff" unit prepares to take off during recovery efforts following Hurricane Maria, in Isla Grande, Puerto Rico, October 6, 2017. REUTERS/Lucas Jackson SEARCH "JACKSON TIRADO" FOR THIS STORY. SEARCH "WIDER IMAGE" FOR ALL STORIES. Tropical rain splashes on a runway as HH-60 Blackhawk helicopters from 101st Airborne Division's "Dustoff" unit wait for weather to clear during recovery efforts following Hurricane Maria, in Isla Grande, Puerto Rico, October 6, 2017. REUTERS/Lucas Jackson SEARCH "JACKSON TIRADO" FOR THIS STORY. SEARCH "WIDER IMAGE" FOR ALL STORIES. Soldiers from the First Armored Division's Combat Aviation Brigade prepare in their sleeping quarters during recovery efforts following Hurricane Maria at their base in Roosevelt Roads Naval Station, Puerto Rico, October 8, 2017. REUTERS/Lucas Jackson SEARCH "JACKSON TIRADO" FOR THIS STORY. SEARCH "WIDER IMAGE" FOR ALL STORIES. A soldier from the First Armored Division's Combat Aviation Brigade prepares in his sleeping quarters during recovery efforts following Hurricane Maria at their base in Roosevelt Roads Naval Station, Puerto Rico, October 8, 2017. REUTERS/Lucas Jackson SEARCH "JACKSON TIRADO" FOR THIS STORY. SEARCH "WIDER IMAGE" FOR ALL STORIES. Pilot Eldwin Bocanegra Torres speaks with residents isolated by landslides in the mountains after unloading water and food from a helicopter during recovery efforts following Hurricane Maria, near Utuado, Puerto Rico, October 10, 2017. REUTERS/Lucas Jackson SEARCH "JACKSON TIRADO" FOR THIS STORY. SEARCH "WIDER IMAGE" FOR ALL STORIES. An HH-60 Blackhawk helicopter from 101st Airborne Division's "Dustoff" unit takes off behind Crew Chief Alexander Blake and his fellow soldiers during recovery efforts following Hurricane Maria, in Morovis, Puerto Rico, October 5, 2017. REUTERS/Lucas Jackson SEARCH "JACKSON TIRADO" FOR THIS STORY. SEARCH "WIDER IMAGE" FOR ALL STORIES. Crew chief Kenney shelters under the blade of an HH-60 Blackhawk helicopter from 101st Airborne Division's "Dustoff" unit preparing to take off during recovery efforts following Hurricane Maria, in Isla Grande, Puerto Rico, October 6, 2017. REUTERS/Lucas Jackson SEARCH "JACKSON TIRADO" FOR THIS STORY. SEARCH "WIDER IMAGE" FOR ALL STORIES. Pilot Joseph Swift prepares for a night flight on an HH-60 Blackhawk helicopter from 101st Airborne Division's "Dustoff" unit during recovery efforts following Hurricane Maria, in Arecibo, Puerto Rico, October 5, 2017. REUTERS/Lucas Jackson SEARCH "JACKSON TIRADO" FOR THIS STORY. SEARCH "WIDER IMAGE" FOR ALL STORIES. Residents wait for soldiers in UH-60 Blackhawk helicopters from the First Armored Division's Combat Aviation Brigade to deliver food and water during recovery efforts following Hurricane Maria, in San Lorenzo, Puerto Rico, October 7, 2017. REUTERS/Lucas Jackson SEARCH "JACKSON TIRADO" FOR THIS STORY. SEARCH "WIDER IMAGE" FOR ALL STORIES. UH-60 Blackhawk helicopter pilot Chris Greenway receives a hug from a woman thanking him for water as he works with the First Armored Division's Combat Aviation Brigade during recovery efforts following Hurricane Maria, in Verde de Comerio, Puerto Rico, October 7, 2017. REUTERS/Lucas Jackson SEARCH "JACKSON TIRADO" FOR THIS STORY. SEARCH "WIDER IMAGE" FOR ALL STORIES. The contents of a home are seen from the air during recovery efforts following Hurricane Maria near Utuado, Puerto Rico, October 10, 2017. REUTERS/Lucas Jackson SEARCH "JACKSON TIRADO" FOR THIS STORY. SEARCH "WIDER IMAGE" FOR ALL STORIES. An HH-60 Blackhawk helicopter from 101st Airborne Division's "Dustoff" unit lands in a field to avoid lightning during recovery efforts following Hurricane Maria, in Manati, Puerto Rico, October 5, 2017. REUTERS/Lucas Jackson SEARCH "JACKSON TIRADO" FOR THIS STORY. SEARCH "WIDER IMAGE" FOR ALL STORIES. Soldier Thomas looks out of the window of an HH-60 Blackhawk helicopter from 101st Airborne Division's "Dustoff" unit, loaded with relief supplies, during recovery efforts following Hurricane Maria in Isla Grande, Puerto Rico, October 6, 2017. REUTERS/Lucas Jackson SEARCH "JACKSON TIRADO" FOR THIS STORY. SEARCH "WIDER IMAGE" FOR ALL STORIES. Residents stand in front of wind-damaged trees as they wait for soldiers in UH-60 Blackhawk helicopters from the First Armored Division's Combat Aviation Brigade to deliver food and water during recovery efforts following Hurricane Maria, in San Lorenzo, Puerto Rico, October 7, 2017. REUTERS/Lucas Jackson SEARCH "JACKSON TIRADO" FOR THIS STORY. SEARCH "WIDER IMAGE" FOR ALL STORIES. A message written on the rooftop is seen from the air during recovery efforts following Hurricane Maria near Humacao, Puerto Rico, October 10, 2017. REUTERS/Lucas Jackson SEARCH "JACKSON TIRADO" FOR THIS STORY. SEARCH "WIDER IMAGE" FOR ALL STORIES. Crew chief Alexander Blake from 101st Airborne Division's "Dustoff" unit loads water into a helicopter during recovery efforts following Hurricane Maria, in Isla Grande, Puerto Rico October 5, 2017. REUTERS/Lucas Jackson SEARCH "JACKSON TIRADO" FOR THIS STORY. SEARCH "WIDER IMAGE" FOR ALL STORIES. An HH-60 Blackhawk helicopter from 101st Airborne Division's "Dustoff" unit lands in a field during recovery efforts following Hurricane Maria in San Sebastian, Puerto Rico, October 6, 2017. REUTERS/Lucas Jackson SEARCH "JACKSON TIRADO" FOR THIS STORY. SEARCH "WIDER IMAGE" FOR ALL STORIES. Sergeant First Class Eladio Tirado from the First Armored Division's Combat Aviation Brigade, who is from Puerto Rico, speaks with residents as he helps during recovery efforts following Hurricane Maria, in San Lorenzo, Puerto Rico, October 7, 2017. SEARCH "JACKSON TIRADO" FOR THIS STORY. SEARCH "WIDER IMAGE" FOR ALL STORIES. Boys carry water away from an HH-60 Blackhawk helicopter after soldiers working with the U.S. Army's 101st Airborne Division's "Dustoff" unit dropped off relief supplies during recovery efforts following Hurricane Maria, in Jayuya, Puerto Rico, October 5, 2017. REUTERS/Lucas Jackson SEARCH "JACKSON TIRADO" FOR THIS STORY. SEARCH "WIDER IMAGE" FOR ALL STORIES. Residents peek through a fence at helicopters from 101st Airborne Division's "Dustoff" unit that had parked in a locked field during recovery efforts following Hurricane Maria, in Lares, Puerto Rico, October 6, 2017. REUTERS/Lucas Jackson SEARCH "JACKSON TIRADO" FOR THIS STORY. SEARCH "WIDER IMAGE" FOR ALL STORIES. “I had absolutely nothing to do with Whitefish Energy receiving a contract in Puerto Rico. I welcome all investigations into the allegations,” Zinke shared a similar sentiment on Twitter. The controversy began after surprising information about the company and contract were reported by the media. “Whitefish Energy, a two-year-old energy company from Zinke’s hometown, had just two employees prior to being awarded the contract last month by Puerto Rico’s quasi-public utility, PREPA,to fix part of the island’s power grid that was destroyed by Hurricane Maria,” according toBusiness Insider. And, in addition to a reported lack of a competitive bidding process, the deal’s terms seem to be highly beneficial to the company. Lawmakers have since expressed an interest in looking into the matter further. Meanwhile, Sanders has indicated the contract is set to undergo an audit.